few houses and nature at 250 meters altitude, surrounded by vineyards, pur - - In the quiet hamlet Tamargada is the beautiful country house Las Palmeras a wonderful place to relax in a rural environment and to find peace. From the large terrace, which is equipped with a grill, table, comfortable chairs and a sofa that can be the wide view over the valley of Tamargada up across the sea can also enjoy. From here you get into the house and directly in the large living room with kitchen - through the large picture windows flooded with light, equipped warm and comfortable. The partially exposed stone walls in most rooms create a special flair. The kitchen is fully equipped, the directly adjoining living area has a comfortable sofa, which can be used as a sofa bed. Radiators provide even on colder days for cozy warmth. Those looking for entertainment (Spanish) well looked after and Wifi with TV. The two bedrooms are furnished with very good mattresses and each a spacious wardrobe, natural stone walls act here almost like painting. The spacious bathroom has a shower with massage jets. Other features of the house are the Bodega with the original wine cooler in the old stone wall, and a stone water filter! So you need not buy water, but can, as before, filter the tap water through the stone vessel and then is replaced by a perfect, pure and tasty water. The house belongs to the Association of Sustainable Tourism and has been awarded four stars. La Gomera is a hiker's paradise! Especially in the green north of the island and the National Park Garjonay wait countless trails to you. The small town Tamargada is still largely unspoilt, off the beaten track. They will love it! Ruhe pur! Die Bodega ist der Hit! Über Pfingsten 2016 waren wir wieder auf La Gomera und haben eine Woche in der Casa Las Palmeras in Tamargada verbracht. Da wir sehr kurzfristig buchen wollten, hatten wir große Schwierigkeiten, eine freie Unterkunft zu finden. Canarianfeeling konnte uns dann glücklicherweise doch noch etwas vermitteln und so lernten wir Tamargada kennen. Und was soll ich sagen: wir waren restlos begeistert! Das Haus ist etwas ganz Einmaliges und das viele Grün im Norden - das war einfach nur schön! Auch das Wetter spielte mit und wir wissen ganz genau: wir waren nicht zum letzten Mal in Tamargada! 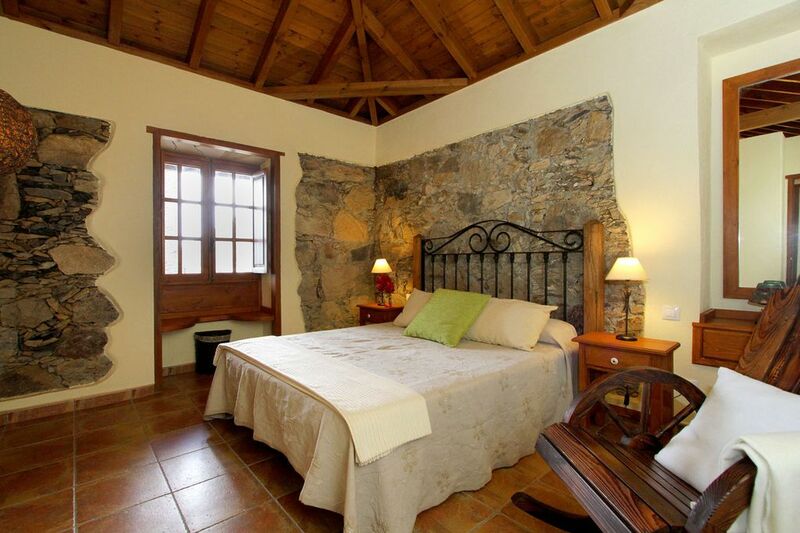 The Casa rural Las Palmeras promises a relaxing, stay close to nature in an authentic environment. For Baden invites in the summer months the sea water down the beach of Vallehermoso one, the beaches of Valle Gran Rey are just 45 minutes away by car. The paths you are here right at your feet and the village of Vallehermoso with its beautiful Plaza, cafes, restaurants and shops is only 3 Km. Der Preis von 60 Euro pro Nacht bezieht sich auf eine Belegung mit 2 Personen. Für jede weitere Person werden pro Nacht 7 Euro berechnet.